Driven by its “people helping people”motto, a nonprofit donated $5,000 to help local victims of domestic violence Saturday. 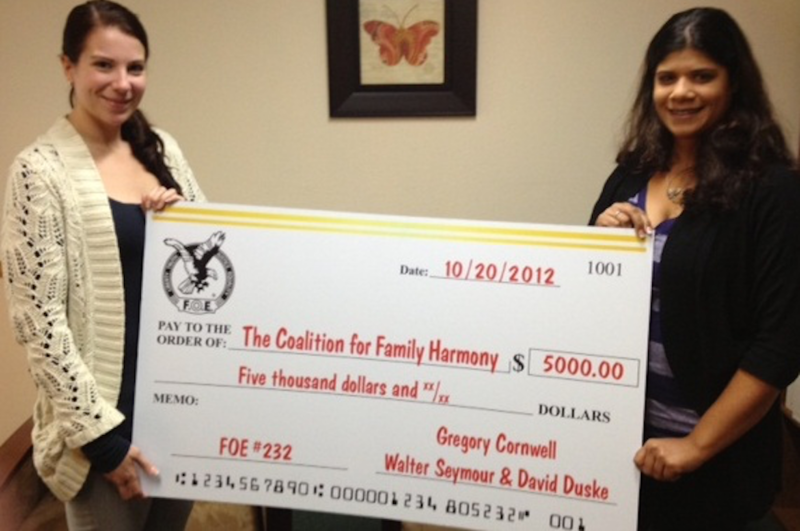 The Oxnard Eagles gave the Coalition for Family Harmony the money, one of the largest grants the group has awarded, at the Eagles’ Western regional conference, which ran from Friday to Sunday. The Oxnard-based coalition received the grant because of its efforts to educate the community and care for victims of domestic violence and sexual assault, according to Shelly Knappenberger, the Eagles’ social room manager. “We chose the coalition so they can continue to help and educate youth and women and people can continue to have a place to heal from the troubles they have been through,” Knappenberger said. The Fraternal Order of Eagles, Oxnard Aerie No. 232, is part of an international network that raises funds to donate to local charities. The Oxnard Eagles each year give six $500 scholarships to students in the Oxnard School District and sports organizations as well. The group has more than 600 members. “With our organization we know our donations are going to reputable organizations,” said John Wells, 88. The Port Hueneme resident has belonged to the Oxnard Eagles for 53 years. The coalition, at 1030 N. Ventura Road, provides families and domestic-violence victims counseling, emergency shelter and legal services. The organization also offers outreach to educate young people on prevention and how recognizing relationship violence. The grant money is expected to help update the children’s playroom at a center used for therapy. Toys, easels and a wooden playhouse need to be replaced, and other therapy tools need to be added, said Janine Ivy, the center’s crisis response intervention co-coordinator. Through its programs, the coalition helped 75 child victims of sexual assault and about 65 child victims of domestic violence last year. At the conference ceremony at the Oxnard Eagles hall, 4684 Saviers Road, guests listened to how the coalition helped a local youth victim and her family. The Oxnard Eagles presented a large check to Ivy and Caroline Sutton, executive director of the coalition. An audience of more than 150 Eagles members from Arizona, Nevada, Hawaii and California applauded the coalition. “If this isn’t people helping people then I’ve never seen it in my life,” said Dave Duske, Eagles conference host.